Speaking of Christmas shopping, I’ve been doing some shopping myself. I am a lover of all things Gymboree and, I’m ashamed to say, rarely can I resist a good Gymbo sale. Right now they’ve got their ‘Friends and Family’ promotion going on. And, I guess I must be a ‘friend’ because I got 30% off everything I bought. 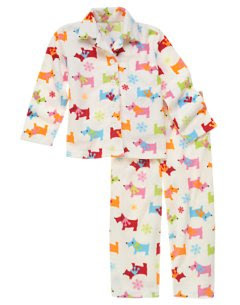 And since we give new jammies as a gift to all our kiddos on Christmas Eve, I had all the justification I needed. I might have added a few more things in my cart. A few Vivi sized things. Like I said, I can’t really help myself. But really, if you shop at the right time, you can get some great deals. This shirt and these jeans? After the 30% off, the entire outfit costs less than $15. That, I can not resist. And if you shop now you can earn gymbucks, but that’s a whole ‘nother post. All that to say, I am justified. I am. P.S. If you’re similarly weak-natured and/or in need of some cute kid clothes, the code for 30% off is GYMFAMILY. I was just in Gymboree doing my "friend and family" thing a couple days ago! Absolutely, hands-down my favorite place to shop…especially during Gymbucks! Have you ever been to a Gymboree outlet? Amazing deals! You can easily get an outfit for under $10…if you aren't afraid to do a little digging! Too funny – I just placed my Gymbo order yesterday. Pretty much everything for Abby, and couldn't resist some matching things for her little sister as well (by "little" I mean 7 months younger). I love a good Gymboree sale! I'm with you, cannot resist a Gymboree sale of any kind. 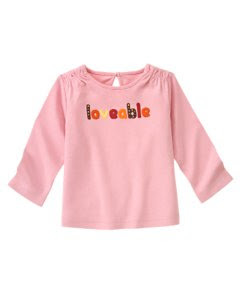 There clothes are resistant to toddlers' boys and girls. It washes well and mostly, they don't shrunk, good quality and great price. And the Gym bucks are the best! Good luck staying away from internet shopping, on your yammies! my girl is wearing that shirt in my last post!! :O) cute stuff. I absolutely love Gymboree! Gabby was always dressed in it. Now that she is older (10.5) some of their things are to small and young for her. I do shop at their sister store Crazy Eight and Gap for her though! When little emperor comes believe me I will be shopping there again. Maybe I should put somethings away for LE now!! I have the updated pics and these boys are absolutely handsome!! There are 2500 grants available. I am weak!!! Those are too cute!! 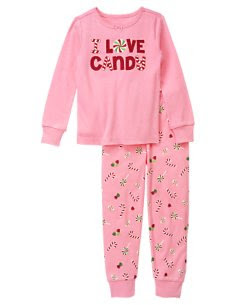 Thanks, I just popped over and ordered matching family holiday pj's! And the very cute panda rain jacket for my sweet girl. So fun! Thanks for the encouragement – My jammies shopping is done now! Just what I was looking for too! 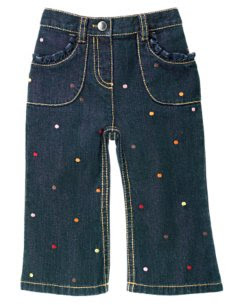 I love gymboree as well…..but we have to stick with leggings for the skinny minnie Vivi. The jeans fall off of her; even the ones with the adjustable waists. She just picked out a panda outfit from there and wants to wear it all the time! Love, love, love Gymbo, but now Matilda Jane is taking over! Pure cuteness. Pure love! You can enter her Website from there and if you click on the Platinum button on the bottom right hand corner of the website (not blog) there is her Platinum/Art Fair collection.